Picking for a good planer is not an easy job because there are several things that you need to consider before making a choice. While there are hundreds of reviews to give you all the information you need online, it’s hard to find the luxury of time to go through with all of it. 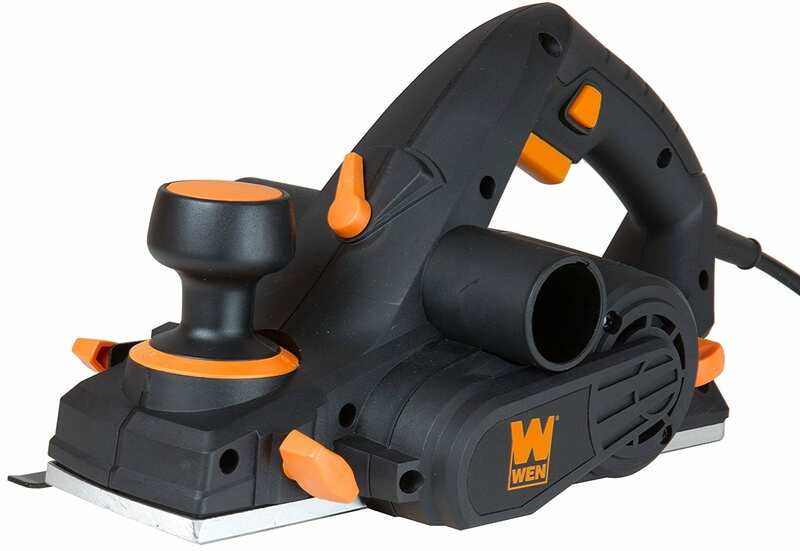 But doing my homework, I find WEN 6530 perfect for me because it has the features for easy and convenient usage and with a 6-amp power motor that provides 34,000 cuts per minute, it is effective and efficient to use for my projects. Therefore this review will give you the necessary information and details about this power tool and why it should be on top of your list. I was introduced to woodworking activity few months back and got hooked with it after a few tries. You need to give yourself some time until you get the hang of it. It can be hard but when you start to find your way with it, it can be really fun. It may not be your normal kind of fun because it is different and unusual, but i am enjoying it especially doing a lot of DIY projects at home. In no time I may be able to transform it to a rustic-boho themed house. Whenever I needed a planer, I would borrow one from my friend and has been using his until recently when I decided to purchase one for myself. I tried this WEN 6530 6-Amp Electric Hand Planer, 3-1/4-Inch because of the good price, but after using it, I am totally happy and very glad it is what I choose from among the many planers available. This planer is specially designed to fit the needs and requirement for a basic planer that can be reliable to do most planing tasks and applications and is powerful and efficient enough to manage any kind of material and produce smooth and outstanding finish. Hence, whether woodworking is your professional job or have it as a hobby, either way, this planer can be useful for you. However, it is especially ideal for home use that does not necessary require heavy material and wood applications. It is handier and more convenient to use for quick fix. In choosing for a good planer, it helps to check these following factors to help you in your decision-making. A good planer should of course be able to do the job that it is expected of. We choose which planer to buy based on the task or project at hand. Make sure therefore that the planer you pick has the functionality you need to complete the job for it to be effective. Each planers has its own specifications and features that may be useful and advantageous for you depending on different wood applications. In choosing for the best planer, check that is has a lot of feature that will help you increase your productivity and produce quality outputs. A high powered motor and high speed will give you fast performance, and with its other added features combined will give smooth finish. In this way, you will be able to save time, effort and money. Choose a planer that will allow you to make different cuts and be used in different wood applications so that you can use it in any project that you will be working on. A good planner is one that is made of the highest quality of material that can withstand the heavy duty work and long-time use. It should also include other added features that could further strengthen and make the planer endure even despite the frequent use. Perfect for fixing stubborn doors, fitting edges, alterations, and smoothing rough edges, WEN 6530 6-Amp Electric Hand Planer, 3-1/4-Inch is built with a 6-amp motor with 34,000 cuts per minute for a more efficient use. This planer is also equipped with different features for an increased performance, precise planing and good results. When you purchase this planer, it comes with a dust bag, rabbeting guide, kickstand and a parallel fence bracket. It is designed with 16 positive stops that increase in increments 1/128 inch anywhere from 0 to 1/8 inches allowing you variety of cutting depths depending on what you need for the project you are working on. It has a rabbeting guide as well that can be adjusted to create rabbets up to 5/16 inch in size. This WEN planer is built with a parallel fence bracket to assure you of straight and precise cuts parallel to the edge of the board. This will make sure you will achieve a consistent cut, and especially useful when planing door edges, wood trim and boards. A built-in adjustable wrench is also designed for an easy and convenient change of the blade. Its base shoe even includes a v-shaped groove to help flatten sharp corners easily. With its 6.5 motor power and 34,000 cuts per minute, this planer allows you productivity with an increased quality output in a timely manner. To prevent unwanted cuts and unwanted damage to your blade, a kickstand is a handy feature as it can elevate the blade out from your work surface thus protecting it and at the same time your work surface. This planer also comes with a dust bag that collects dusts and shavings to keep the cutline and your work area clean and clear. It has a parallel fence bracket to guarantee straight and parallel cuts. Dust bag is small that it fills up fast and has to empty the shavings after a few planing. The blade still cuts even at zero setting. In some cases, before making a decision, it is advised to also be keen and get yourself familiar with the customer and market value of the product which can be found from direct feedbacks of the consumers who have already used it. In line with this, I have also checked several review of this product and overall, they were all pleased and glad of their purchase that some even recommended this while others swore to purchase the same kind if they will have to in the future. Most of the customers said that this planer is very affordable for this kind of power tool and very effective for smoothing rough edges and fitting wood. It works great in finishing their project and reliable especially for easy fix. There are some minor details that need improving though. Many mentioned that though it is great that it comes with a dust bag, it is however very small that it fills up pretty fast. One customer has issues with the kickstand that does not snap back in place when he is trying to stay it flat. Overall, however in terms of functionality, this planer gets the work done effectively and efficiently with outstanding result. This heavy duty portable planer is powered by 6-amp motor weighs only around 8.8 pounds, and considered to be one with the lighter weight compare to other planers. It is designed with an over mold depth knob with 10 positive steps for an increased performance and higher output. With 16,500 RPM guarantees smooth cutting to any material- soft or hard. Its other features include the three chamfering grooves, 11.5-inch cast aluminum shoe for added control and better finish, and a dual-side dust extraction on both sides for a cleaner and clearer work space. Package includes the planer, carbide cutting blades, wrench, dust bag, edge guide and kit bag. The first ever planer to have the lock off/lock on button that helps in avoiding accidental startups and provide prolonged operation is powered by a 6.5-amp motor and 16,500 RPM speed for a faster work but smoother finish. It is designed with a dual-mount guide fence with protective shield for a stable planing with a plastic overshoe to avoid any damage of door face. The optimally-angled handle used for forward motion is soft grip for more comfortable use. Made to be both durable and easy to use, this planer from Dewalt is heavy duty enough to be used to all kind of materials and wood applications. The 7.0-amp motor power will guarantee that it can finish the job effective and efficiently. It is highly versatile as it both can accept large high speed steel blades for straight edging and reversible carbide blades for a more detailed and accurate woodworking. A precision machine shoe bottom is designed to provide flat surface finish and precise rabbet joints. With a two-blade cutter head and 17,000 RPM, this planer assures an outstanding performance and a smooth finish. A precision machined aluminum base is designed for this planer for more accurate cuts and a lock-on button for continuous operation. To assure of its user’s comfort, am ergonomically centered balance with rubberizes front and rear handle is designed for this power tool. It comes with a high quality poly v-belt for durability and a machine aluminum and balanced planer drum to reduce vibration when used. It is powered by a 6.5-amp motor thereby giving you more output and quality performance. With planes up to 3 ¼” wide and 5/32” deep in a single pass, this planer is made to deliver top notched performance and smooth planing finish. It is powered by 7.5-amp motor and 16,000 RPM so you can be certain it is capable to be used in any wood applications and be assured of a fast and quality result. Its other features include the depth adjust knob for an easy-to-read scale with stops in 0.1mm increments and a rubberized handle for comfort. Its package includes blade gauge assembly, wrench, guide rule, depth guide and blade set. Each one of us has its own reason in buying a planer. Whether it is used professionally, building a project at home, fixing furniture or for a hobby we are interested in, getting a reliable planer that will fit our individual needs is just as important. With WEN 6530 you are guaranteed performance, precision, and efficiency at a very affordable price. It is high in power and speed that will let you use it in any material and projects. With its added components, it will assure you accuracy, flexibility, convenience and increased productivity. In this way, you are not only saving effort and money but most importantly time.